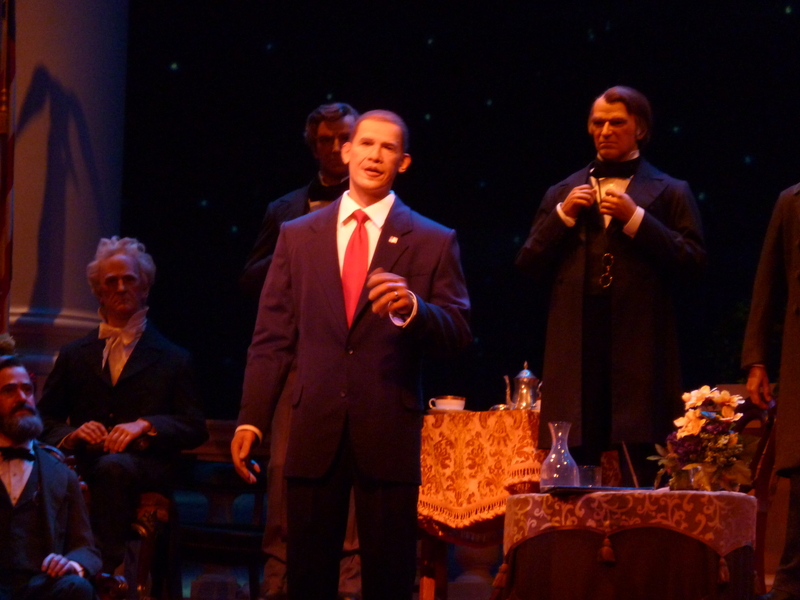 Barack Obama, in the form of an audio-animatronic character, is now appearing in the Hall of Presidents attraction in the Magic Kingdom at Disney World. Disney refers to Obama’s character as the most advanced, lifelike audio-animatronic figure created to date. 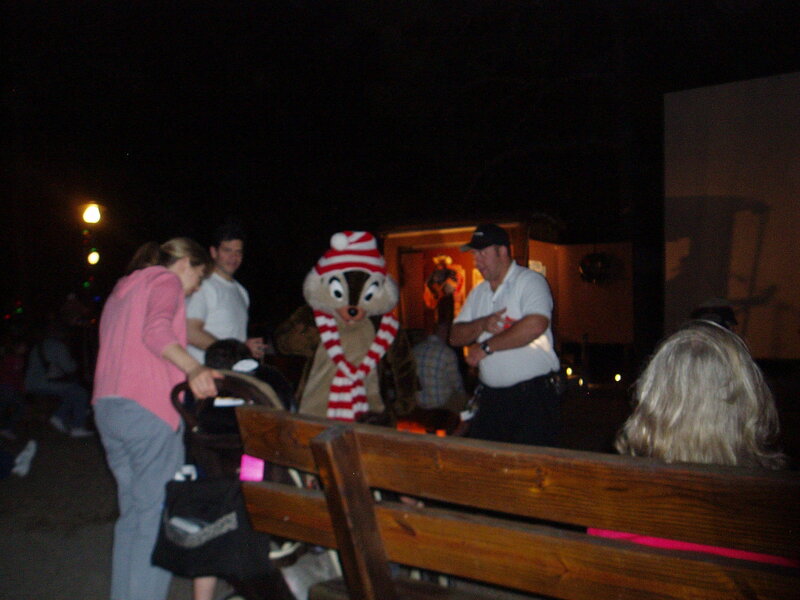 There is a lot about Disney World that is not only entertaining, but very educational as well. 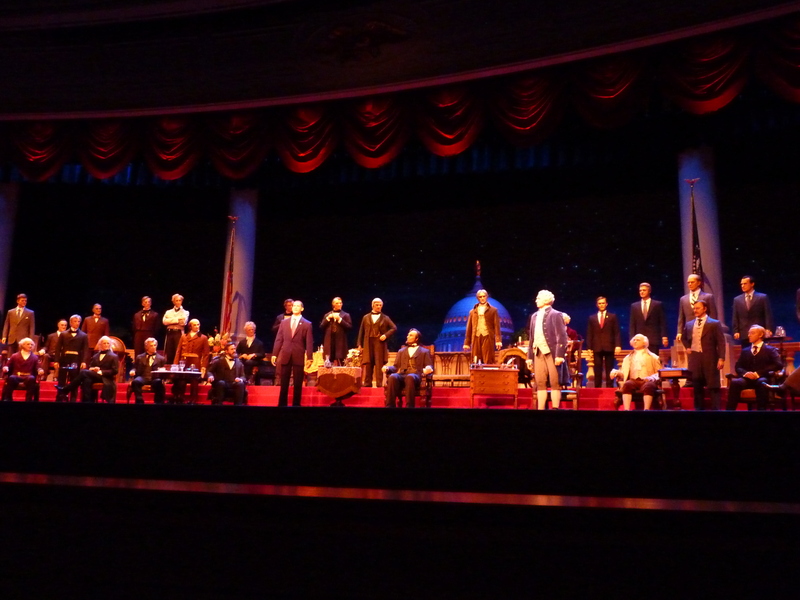 This is especially true in the Hall of Presidents. Located in Liberty Square inside the Magic Kingdom, this attraction was originally envisioned by Walt Disney himself. It performs every half hour on the hour and half hour. The show begins with a multi-media slide presentation that speaks of how our country overthrew our imperialistic roots and decided to elect leaders from ordinary citizens. 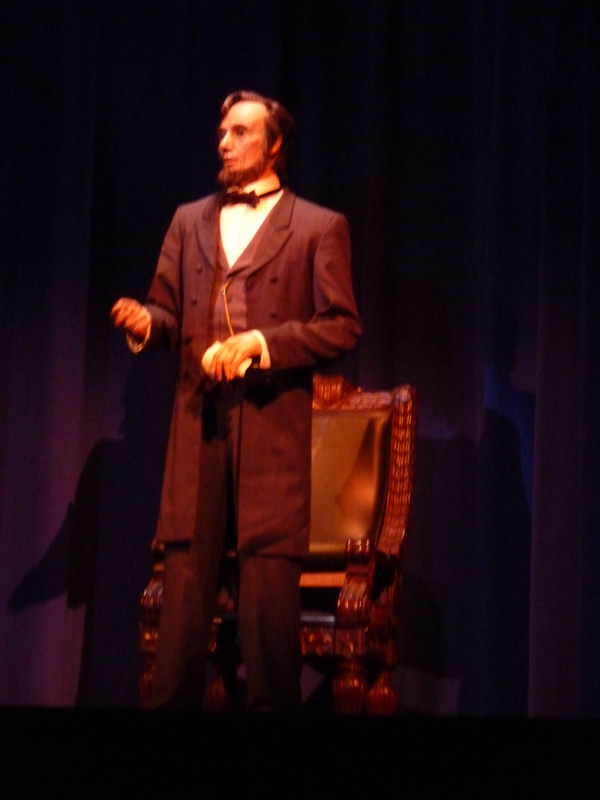 There is a brief mention of some significant moments in presidential history when the curtain raises slightly to reveal an audio-animatronic figure of Abraham Lincoln seated in a chair. This impressive creation becomes eye-popping as Lincoln rises and recites the Gettysburg Address. The curtain falls and the slide show continues. Upon completion, the full curtain rises to reveal all 44 Presidents across the expansive stage. They are introduced, one at a time, in order of their Presidency. For the first time since the inception of this show, George Washington delivers a stirring speech. The climax of the presentation is a speech by Barack Obama’s character as well as his recital of the presidential oath of office. The voice is actually that of the real Barak Obama and was recorded in the White House Map Room. The show was developed with the help of Pulitzer prize-winning historian Doris Kearns Goodwin. The musical score was written by Emmy-winning composer Joel McNeely. Actor David Morse provides the voice of Washington. Morse portrayed Washington in the HBO miniseries “John Adams.” Lincoln’s stirring speech was voiced by the late Royal Dano who was selected by Walt Disney himself to voice the first animated Lincoln for the 1964 World’s Fair in New York. 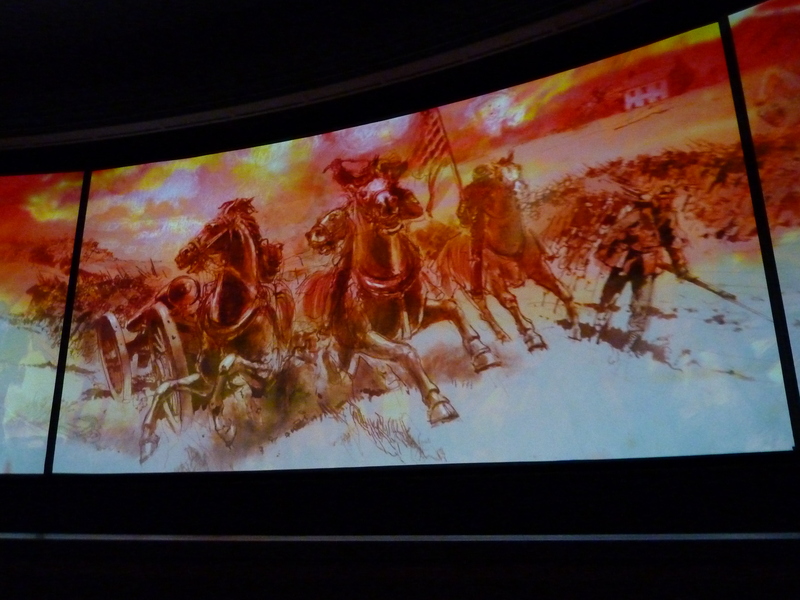 That show later became part of the Great Moments with Mr. Lincoln attraction at Disneyland. Thanks, Amy, for taking these wonderful photos! Disney World has long been known for exemplary customer service. Some people have claimed that this legendary service has diminished somewhat over the past few years. I know that I have experienced some occasional moments of frustration inside Disney World on some recent trips. Yet when my cousins, Doug and Amy, brought their 17 year old daughter, Brooke, for a visit this week, I saw Disney at its customer service best. You see, Brooke is a very special lady. She was born with some kind of un-diagnosable brain condition that makes it difficult for her to communicate. Her vocabulary is very limited. What few words she does know she can only express with muted grunts and gestures. When she walks, she appears slightly lopsided. It is difficult to gage how much she understands or what her maturity level is. She tires easily and can get grumpy when she has had a long, physical day. However, she is a joy to be around. She gets excited easily. It is wonderful to watch her squeal with delight and frantically wave her arms in excitement whenever she encounters something special. 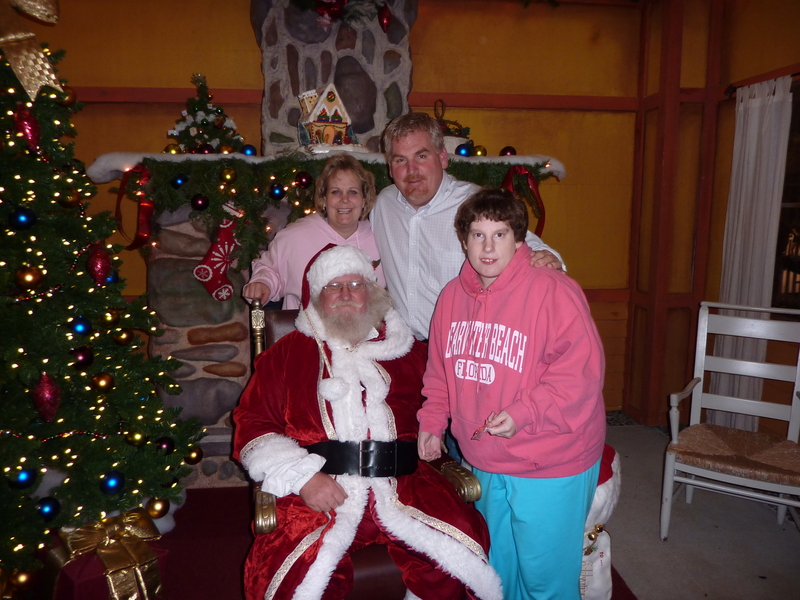 Although Doug and Amy have taken Brooke to Disney World twice before, they never thought to seek assistance for Brooke’s handicap. Part of that is Amy’s natural tendency to never take advantage of anyone. 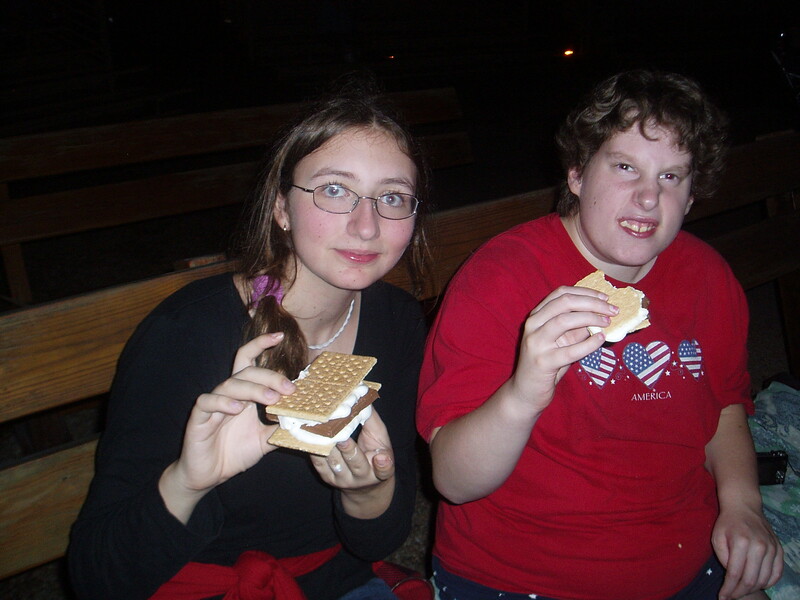 Indeed, once she discovered that the Special Assistance Card enabled Brooke to jump an hour long line at the Toy Story Mania ride, Amy stated she probably wouldn’t do that again because she felt badly that she had gotten ahead of everyone who had to wait so long in line. I asked Amy how old Brooke was (knowing full well she was 17) and then suggested that after 17 years of going the extra mile to care for Brooke, the least the rest of us could do was allow her to opportunity to jump the line a few times. Amy, being Amy, probably still won’t use the card more than once per ride, but I wish she would! 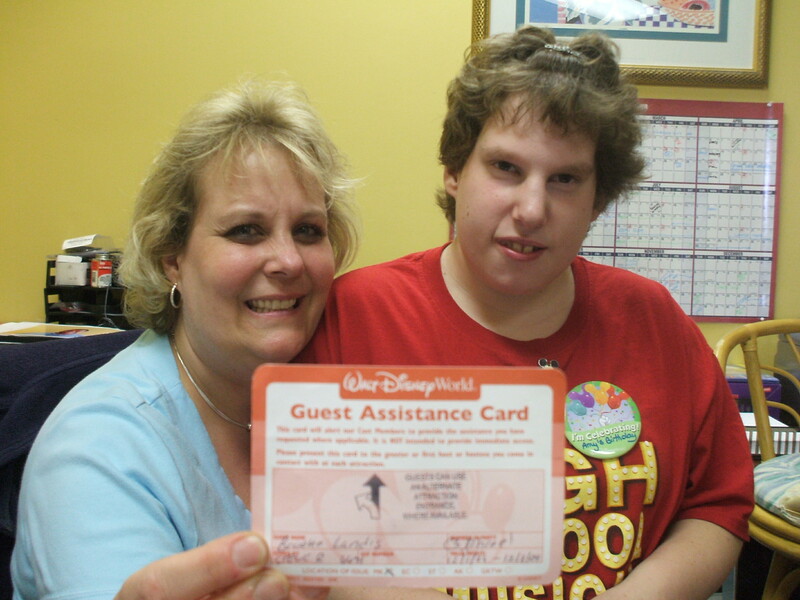 To get the card, Doug and Amy went to the Guest Services window at the Theme Park. 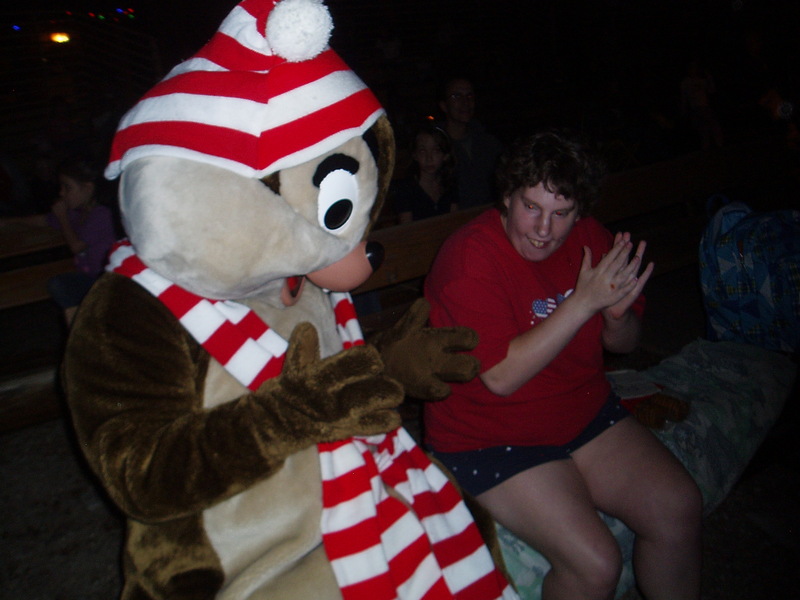 They didn’t have any documentation regarding Brooke’s condition, but the Disney Cast Member only asked to meet Brooke. Once she did, the card was issued without any further ado. It was valid on all Disney property and for the entire length of Brooke’s visit. It allows the guest with a disability and up to five members of their party to have access to all alternate entrances for all attractions. 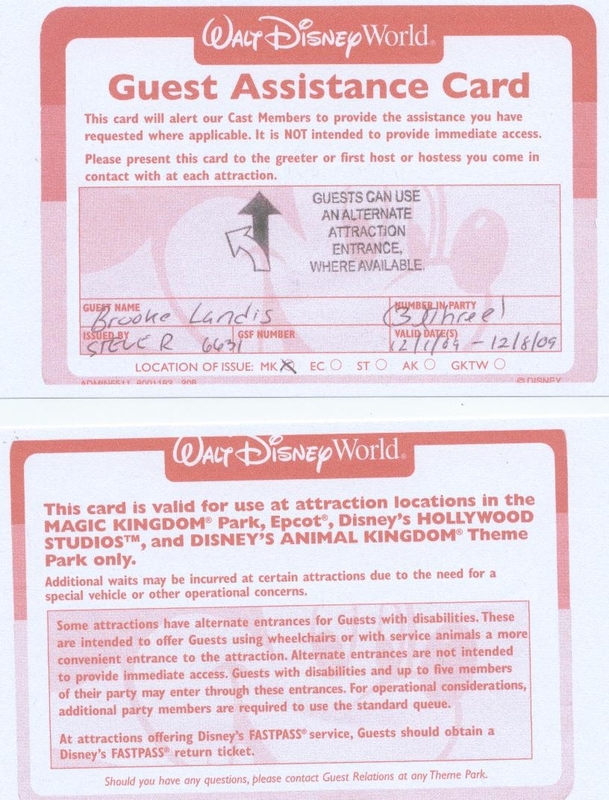 The card goes out of its way to inform guests that it does not guarantee “immediate access.” It also requests that guests obtain a FASTPASS when going on attractions that utilize the FASTPASS system. However, Doug and Amy noted that when they went to an attraction, they were never asked for a FASTPASS and they almost always were able to jump the line for a much quicker access. With Brooke’s physical condition, this was critical as she was able to enjoy so many more attractions for the few hours she could tolerate being in the park before she became tired and irritable. For an angel like Brooke, who can ride the “It’s a Small World” ride twenty times in a row and find absolute delight in each ride, this gesture of extreme customer service on the part of Disney was very much appreciated. Here’s a video of Brooke enjoying the “snowfall” in Celebration with her second cousin–# 1 Daughter! A crow could fly from Disney World to the Tibet-Butler Preserve in less than a half a mile. By car, it’s just a bit further than that. It is worth the drive. Don’t misunder-stand me. I love the mouse. However, I think it’s a good idea for families to do more than visit Theme Parks when travelling to the Disney World area. After all, Florida contains the only mixture of tropi-cal and subtropi-cal climates in the continental USA. There’s a lot to discover. 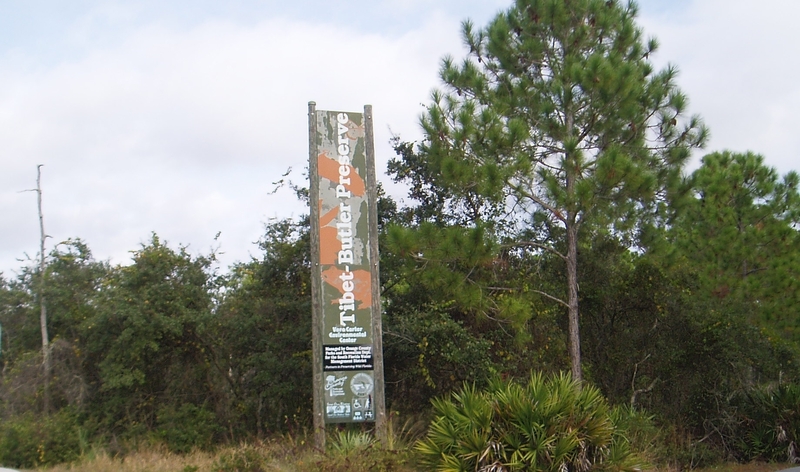 Here’s a simple and easy way to experience the real Florida–take an hour break from the tourist area to hike one of the short trails in the Tibet-Butler Preserve and spend a few minutes reviewing the information inside the Vera Carter Environmental Center. From Disney World, you drive north on Route 535 to the preserve on the right hand side of the road. You’ll get there in about 5 minutes. Parking and ad-mission are free. 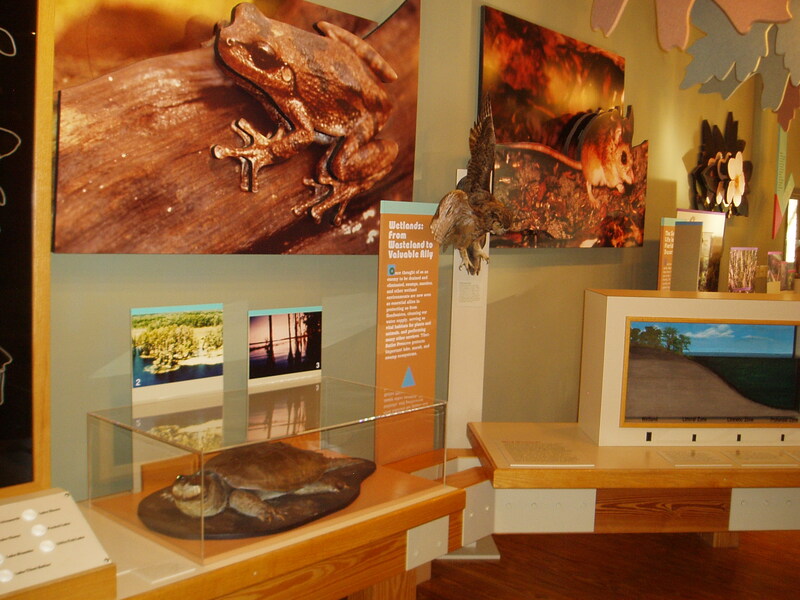 The preserve is open 8am to 6pm Wednesday to Sunday. Heck, you can even arrive there at 8am and still be at the Theme Park when it opens at 9am! The 440 acres of the preserve were purchased by the South Florida Water Management District through the “Save Our Rivers Program” in 1989. Here, you might catch a glimpse of a bobcat, fox, swallow-tailed kite, gopher tortoise, bald eagle or even a rare indigo snake. Song birds are ubiquitous as well. 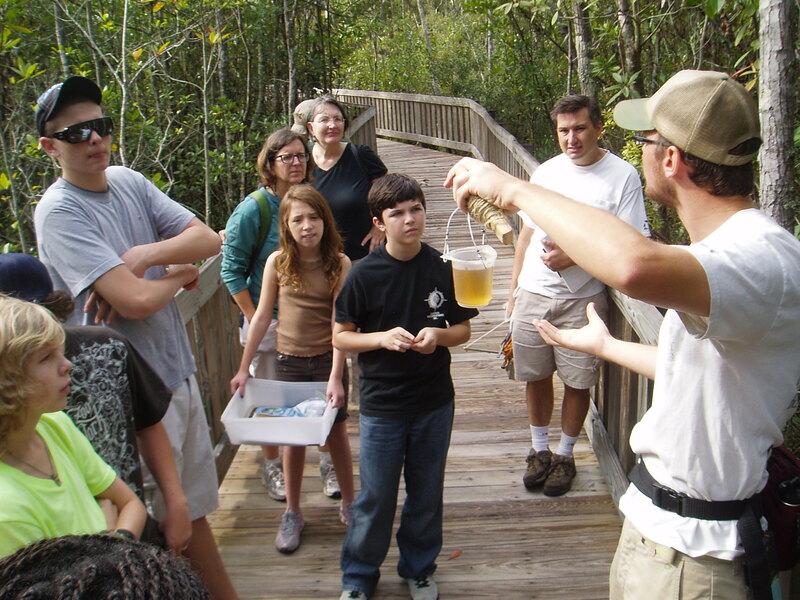 You can hike through bay and cypress swamps, freshwater marshes and scrub and pine flatwoods. One of the neat features of the preserve is the Interpretive Trail Guide. This handy pamphlet corres-ponds to marker pylons on the trails inside the preserve. At each pylon the guide gives educational tips and suggestions of things to observe. It is detailed, well written and appropriate for all age levels. Within moments of entering the preserve you will feel as though you have entered a new world. Peaceful tranquility will envelop you. The hiking trails are wide and smooth. Well constructed boardwalks traverse the swampy areas. Follow the trail to the Osprey overlook. Once there, you can rest on one of the benches and enjoy the view of the water lilies adorning the edges of Lake Butler. 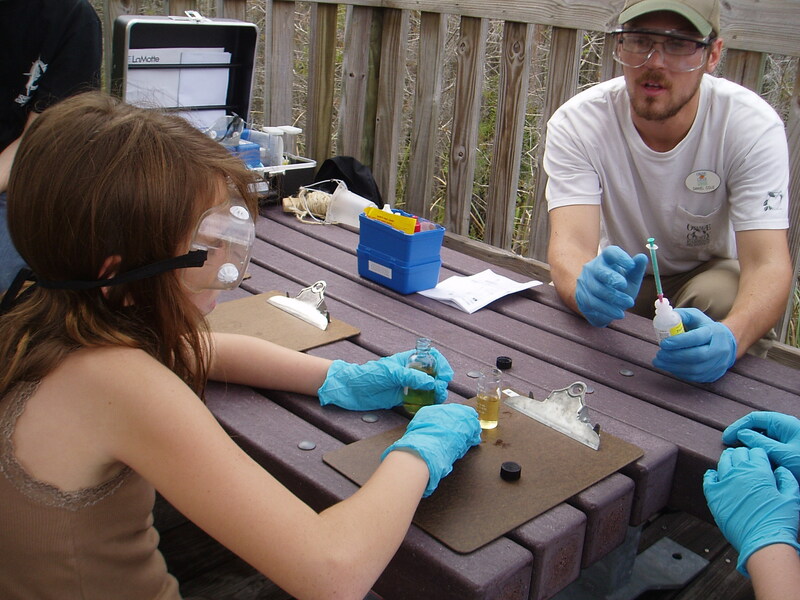 Our daughter’s Montessori classroom went to the preserve for a lesson in water quality. 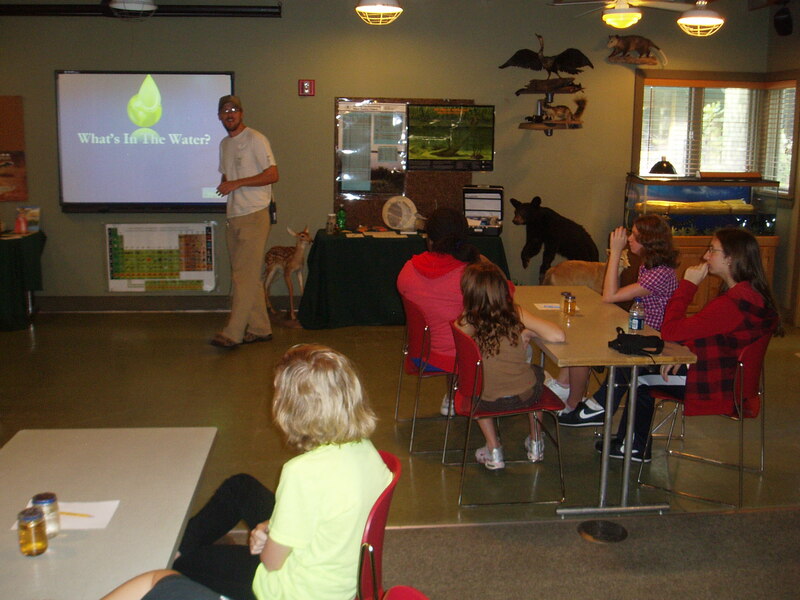 After a brief presentation in the classroom, the instructor took the students out to the marsh. 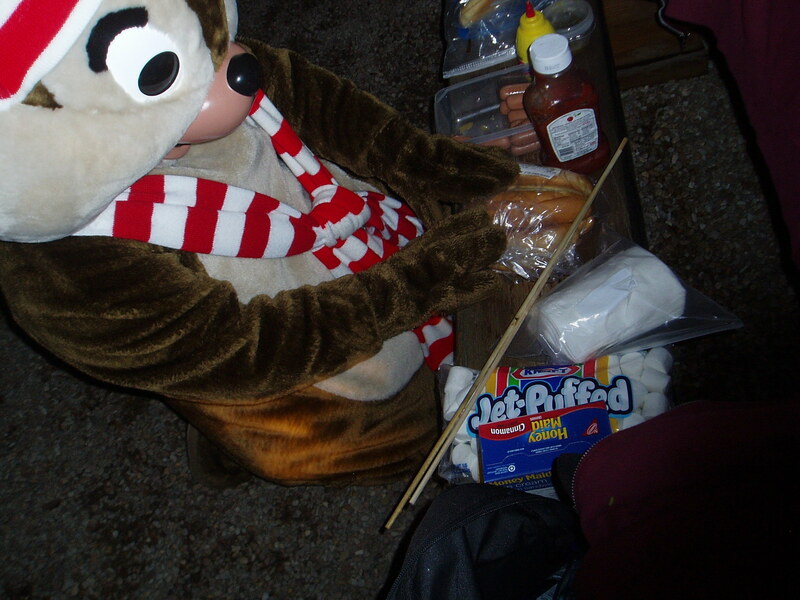 Samples of water were obtained. The students donned goggles and gloves, then tested the water for oxygen content, ph levels, turbidity, temperature, contaminants and so forth. It was a great lesson. The students were engaged with rapt attention. 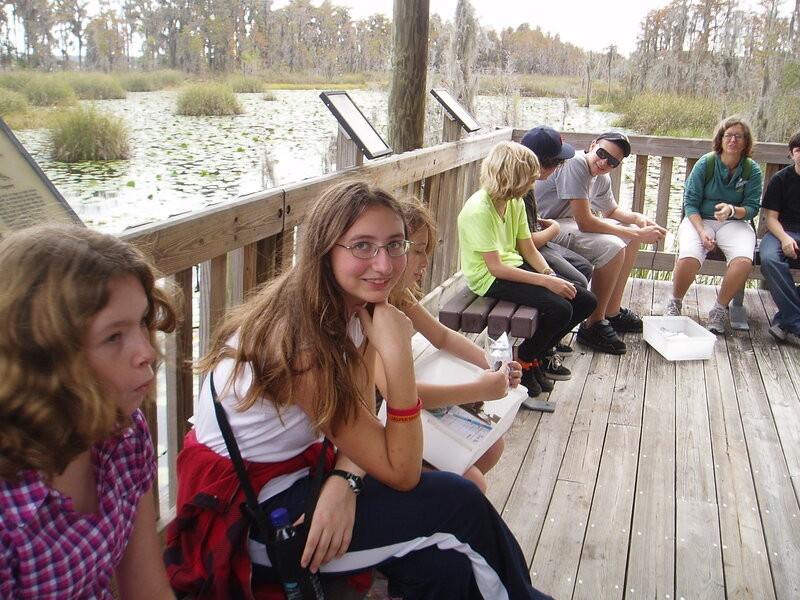 Mrs. LanceAround and I took a moment to sit on the benches under the Osprey Pavillion and enjoy the tranquil serenity of the surrounding fresh water marsh and view of Lake Butler. It was a much needed respite from our hectic schedules. 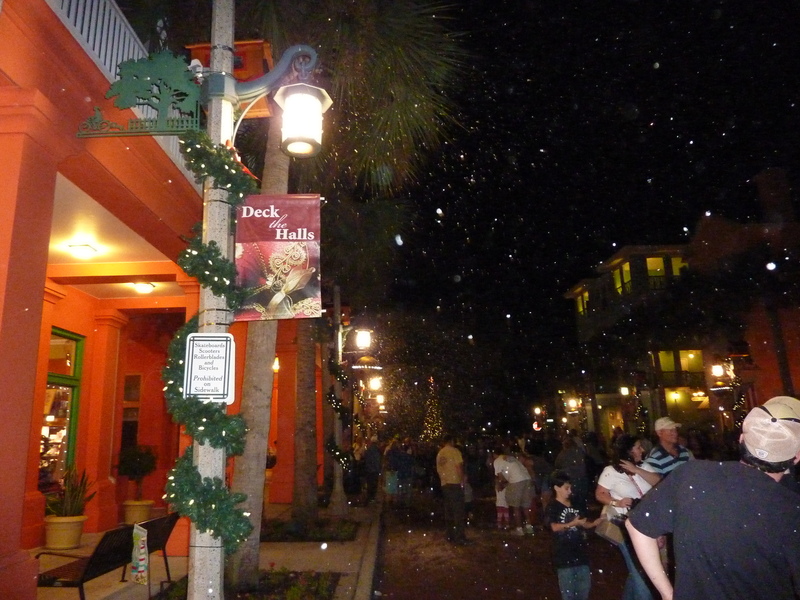 Was it snowing in Celebration, FL last night? My cousin Doug, his wife Amy and their 17 year old daughter, Brooke, came down from Pennsylvania to visit us this week. Brooke is a very special person. She is an angel. She was born with an unknown condition that makes it difficult for her to communicate. Doctors can’t figure out exactly what is wrong, so they simply say she is mentally challenged. But it is a joy to watch her squeal with delight when she gets excited. Last night we went to Celebration, FL, the town that Disney built. 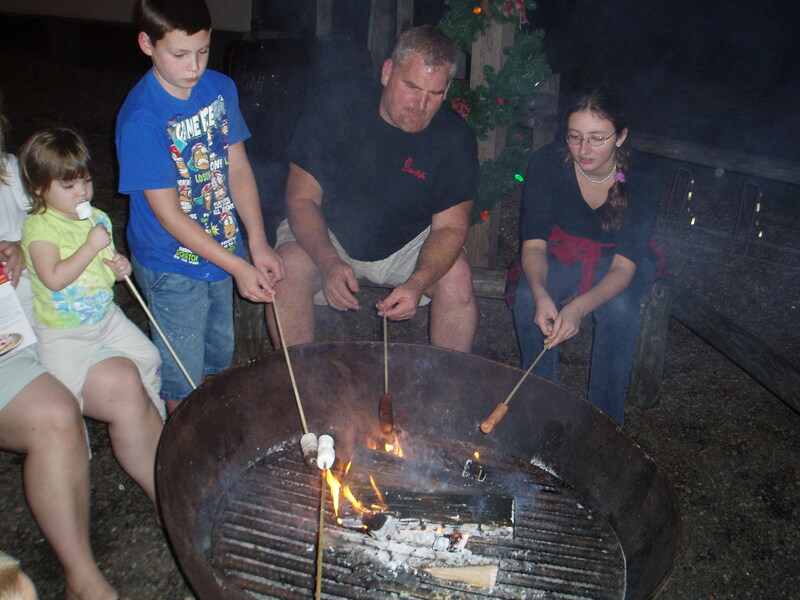 Every year from the end of November to the beginning of January they have a nightly celebration downtown. Every hour at 6, 7, 8 and 9 o’clock a half dozen specially designed machines blanket Market Street with “snow.” Of course, you can’t make real snow in the warm temperatures of Florida. It is really flakes of soap suds. But for all intents and purposes it gives the illusion that the street is being blanketed with snow. The children cheer with excitement as the downtown music system gives a brief, “magical” introduction, the snow machines hum to life and white suds begin to fall as holiday music plays in the background. No one was squealing louder or jumping higher than Brooke. Then there is a small, ginger bread house. When you walk inside, you find a small, hefty man in a red suit with a white beard. Brooke had a look of astonishment on her face. She immediately ran to the man and sat on his knee. The downtown has a wonderful little lake you can walk around, a hotel, at least seven different restaurants of various ethnicities and several other shops to enjoy. We had a delicious Italian meal at Antonio’s Restaurant. We sat outside with a view of the lake, downtown sidewalk fountain and the kids delighting in the hourly snowfall. It is also fun to drive around town and see many homes decked out in the most spectacular display of Christmas decorations I have ever seen. There is no charge to enjoy the “snowfall.” The train, carriage rides and “ice” skating do cost money. You can pay to have a professional picture taken with Santa, but just to sit on his lap and use your own camera is free. Occasionally a quartet of Dickens Carolers will serenade you as you stroll through the market area. What a quaint and wonderful evening.